Thank you to the many people who have been a part of our success over the last 50 years. We look forward to continued success with all of those who have made this milestone possible. View the full Properties Magazine insert here, or read the article below. The firm’s slogan is ‘Defining the Skyline’ and is quite appropriate, since they have completed a majority of the new buildings in Cleveland, Toledo and Columbus. With three offices, OCP has become Northern Ohio’s largest interior contractor. OCP Cleveland employs a significant number of tradespeople in Northeast Ohio, while statewide OCP keeps over 500 employees working. An average year’s business consists of typically 200 or more projects, roughly 50/50 private and public. 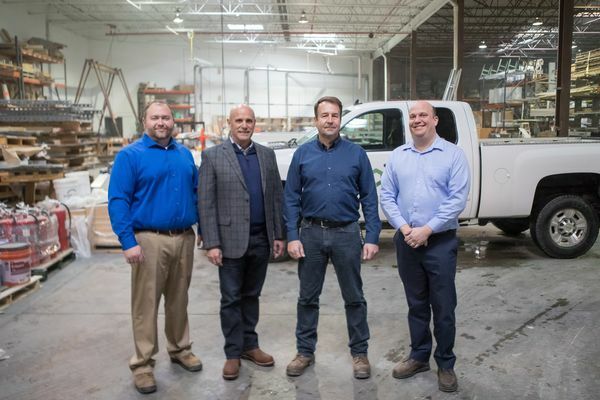 In Toledo, during the mid-1980s, under a Bowling Green State University internship, Matt Townsend began working for Ohio Ceiling & Partitions, which had been founded in 1968 by Barney Paskiet. In 1995, to reflect Ohio Ceiling and Partitions’ growing capabilities, the firm’s name was changed to OCP Contractors. Two years later, Matt Townsend purchased the majority of stock in OCP and became president. With an eye to expand the firm, he looked for someone to head up an office in Cleveland. In 2004, Sellers partnered with Townsend, opening the Cleveland office. “Our initial hope was for OCP Cleveland to be as successful as our office in Toledo had been for over 35 years,” says Townsend. Due to Sellers and Townsend’s combined reputations and the fantastic team built in Cleveland, that is exactly what happened. “The relationships that many of our employees in the Cleveland market had from their very experienced past employment, played a huge roll in our success in the Cleveland market,” asserts Townsend. With his reputation for honesty, dependability and creativity, Sellers had no trouble finding projects in even some of Cleveland’s slowest years. The Cleveland office’s first project was the Cleveland Clinic’s parking garage at East 93rd. Being a ‘Clinic-Approved’ contractor meant substantial work would follow. In its first year, the team landed more than $5 million worth of projects. In 2009, with OCP continuing to land prestigious projects, the firm opened its third office, OCP of Columbus. Two years later, Sellers was named president of OCP as Townsend became CEO. 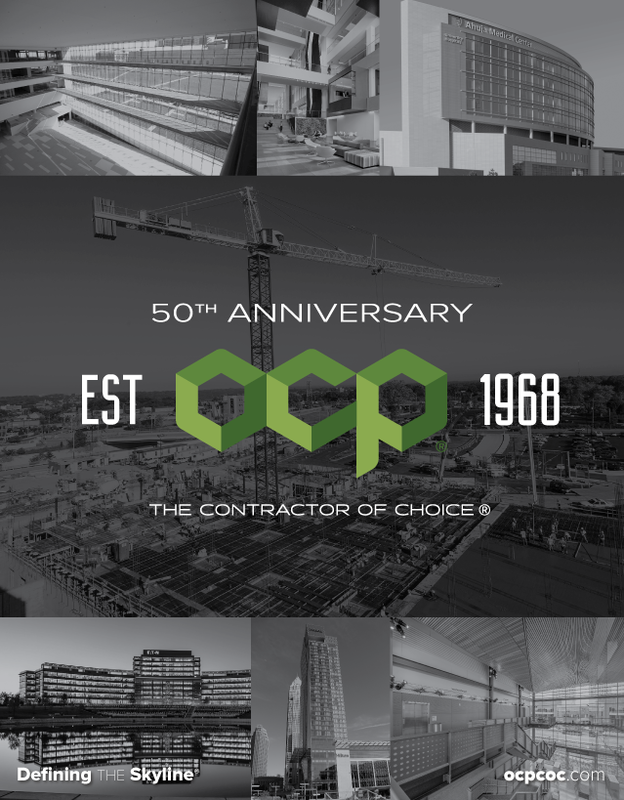 2013 would become a historic year for OCP Contractors as the firm began its prefabricated component system, enabling much of the field work to be preassembled before being delivered to the jobsite. “We typically have a team of carpenters in the shop prefabbing much of our material. They can make whatever multi-repetitious item is needed for the project,” explains Brian Exl, vice-president of Pre-Construction Services. It was also a historic year as the firm completed its largest ever contract – the $16 million combined Cleveland Convention Center and Medical Mart, now known as the Huntington Convention Center and Global Center for Health Innovation. By the end of 2013, OCP Cleveland completed projects including the 600,000-square-foot Eaton Center campus in the Chagrin Highlands of Beachwood, and the seven-story, 639,000-square-foot Goodyear Global Headquarters in Akron. More than 100 tradespeople were employed on each project. Perceiving further opportunities, the firm expanded once again in 2015, adding a certified spray insulation group. “This gives us the opportunity to create a continuous insulation system over the exterior sheathing, creating a great air barrier,” says Exl. The firm’s package now covered most all specialties from CSI Division 6 through Division 10. “And, if the CM needed someone to handle dock equipment, we’d add that in as well – whatever it took to meet a customer’s needs,” says Sellers. “Another of our projects utilizing precut and preassembly was the Oatey World Headquarters, where again, probably better than 50% of the materials were precut before delivery,” says Exl, noting that while unions were initially worried that preassembly was all about eliminating labor, they’ve come to realize that the work can now be done more safely and more conveniently in a shop environment. In addition to running one of the most successful interiors firms, Sellers makes time to give back to the industry where he found his success. Over the years, he’s been president of AGC of Ohio and Cleveland AGC (Associated General Contractors), and is the current president of AWCI (Association of the Wall and Ceiling Industry). He is presently chairman of the Construction Employers Association (CEA) and serves on the Carpenters’ Pension Board. Where too many contractors claim “our employees are our biggest asset,” OCP puts them to shame with its training and benefit plans. Since its inception, Townsend and Sellers have promoted annual bonuses and profit sharing. While other companies may fear training their employees will make them easy targets for their competitors, OCP aims to offer its people the best training available, like sending them to the Lean Construction Institute. “Lean construction is a core value of what you can expect when you have OCP on your team along with IPD and design assist project delivery methods,” says Townsend. “Everyone has a reputation, and our employees’ reputations drive our firm’s reputation,” philosophizes Sellers. Family-friendly is another description that aptly fits OCP. Family outings and employee perks are common and enjoyed by all the staff. The firm also provides its people with the top technology available, from iPads and Plan Grid, to an Oracle-powered comprehensive software package. “We know our competition is watching what we do and are quick to pick things up that have worked for us,” says Sellers. “One of the many reasons OCP has been successful over the past 50 years is that we are continually pushing to be the best at managing project schedules and always work to beat the project end date,” Townsend says. Focusing on his customers’ needs and the development of his team, Sellers is in an enviable position for the foreseeable future. Their reputation with customers is unmatched anywhere in the state, and their 50-plus awards attest to the quality of their work.